The world we live in nowadays is one where everything can happen, and that means that planning for various survival situations is imperative. 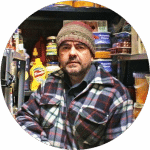 Being prepared even in the most dangerous situations is equivalent to knowing how to make all sorts of homemade, DIY items which can potentially save your life in case of a disaster. One of the skills you have to master is how to make a gas mask quickly, because there are a number of perilous events that occur frequently – like a fire or a terrorist attack – when owning a gas mask can make the difference between life and death. As such, a gas mask is something that filters out the toxins in the air by employing the principle of adsorption and the principle of safety. The store bought items have these features, and some of the most proficient ones are better when it comes to adsorption and safety, because they can filter more foreign substances and be more effective even in increasingly toxic environments. 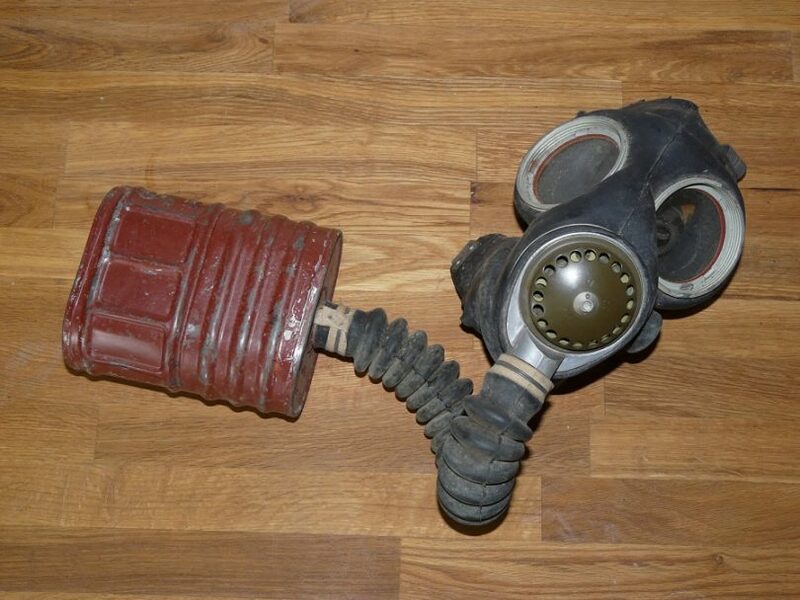 On the other hand, DIY gas masks are just improvised items, and given the fact that you don’t have topnotch materials or last generation tools at your disposal to make sure that everything is air-tight and functioning without fault, you may encounter issues when it comes to both adsorption and safety. That being said, a quick analysis of these two key principles will help you understand how to craft a better homemade gas mask. There is an important difference between absorption and adsorption. The first term refers to the process of encapsulating a substance, while adsorption refers to depositing a certain substance on a surface. In other words, you don’t want your gas mask to be absorbent, but adsorbent, which means it being capable of filtering out all sorts of dangerous particles and gases which might otherwise get stuck in your nose or lungs, and damage your respiratory system, rendering you unconscious. Adsorption can be increased with the proper chemical reactions, keeping in mind that some substances interact and repel or attract each other. As such, if the air particles you want to counteract have a positive charge, you should use a substrate with a negative charge for your gas mask, like activated carbon or zeolites. The efficiency of this principle has already been confirmed even in the most usual situations: in case of fire, it is well know that covering your mouth and nose with a moist cloth is a good idea. Conversely, this principle works only when it comes to particles that are a direct result of combustion, like fire or an explosion, but it doesn’t work as well when it comes to toxic gases or airborne pathogens. Absorption also has an important role in the construction of a gas mask, because the filter doesn’t only have to separate the dangerous substances from the air, but it has to retain them. So if the filter isn’t very absorbent, the durability and resistance of your gas mask may be compromised. As such, if the filter can’t take in anymore particles or dangerous chemicals, it won’t protect you anymore, which means it will be the same thing as having no mask at all. That’s why it’s wise to have some sort of sealing cap put over the air filter in order to prevent damage. But age, moisture and heat are also factors to take into account when it comes to the safety of your gas mask, since they change the chemical composition of the filter. For example, you may build a gas mask today and not need to use it for a few years. But even if you haven’t used it at all until then, it may still become damaged because of the above listed factors. So it’s better to check the functionality of your gas mask, as not to risk it becoming totally useless. Even the older military gas masks degrade over time, so don’t count on the efficiency of a very old item, which maybe hasn’t been kept in the best conditions, because it can put your life in jeopardy instead of saving you. Besides, it’s always best to keep up to date with news regarding dangerous substances, since scientific discoveries are constantly being done, and a substance that was considered safe a few decades ago might be proven dangerous today. It’s the case of blue asbestos which was introduced in the filters of gas masks used in World War II, about which we now know it’s dangerous and can lead to lung cancer. Moreover chromium is another substance that can lead to cancer. So even if you don’t make your own gas mask and buy one from the store, or buy just a filter to replace the old one, it’s best to check if it doesn’t contain asbestos or other hazardous substance. 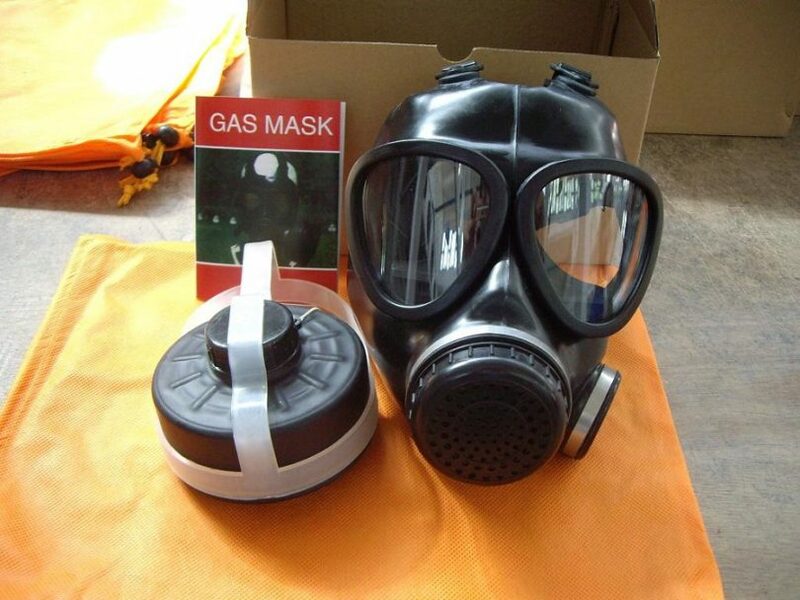 However, even if that may not be the case, some gas masks for instance may use rubber in their construction, which although it isn’t dangerous in itself, will become damaged during time. That can lead to the appearance of cracks and leaks, making your gas masks totally unusable. There is one more thing that can mess with the safety of your gas mask, especially if it’s a standard one: your facial hair. That’s because it makes it less air tight, no matter how long or short your facial hair is. When do you need a gas mask? A fire. Dust and ash can easily get stuck in your nose and lungs, causing you to faint before getting to safety. An earthquake. Fires are more likely to happen during an earthquake, but you may also find yourself immobilized with a lot of dust around you from the collapsing of your office building or home. Having a gas mask handy may save your life. For more tips on how to survive an earthquake, do read our article on this important topic. Terrorist bombings. In Iraq 2007, a group of terrorist bombers used chlorine gas in their attacks, which managed to wound a few hundred people. Who says that can’t happen to us? 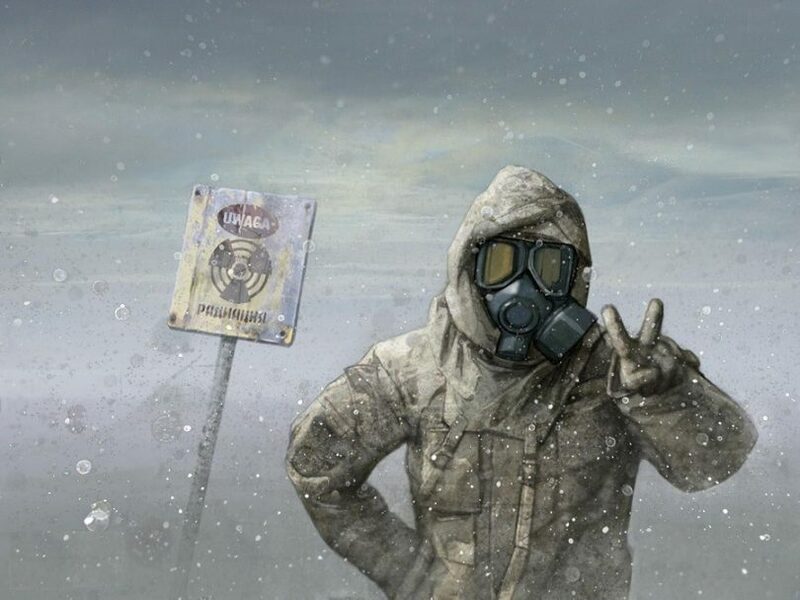 Even if some gases are not necessary lethal, they can make you pretty sick. Otherwise, it’s better to be safe than sorry and be prepared. Riots. CS gas and tear gas are often used to deter rioters from continuing their actions, and if you get stuck in the middle and unfortunately have asthma or other lung affections, these gases can become lethal for you. Check out our article on urban survival tips and guidelines for more information. But you can use a gas mask even in more pacific conditions, like when you need to paint your garage door. Buying a gas mask or making one on your own? 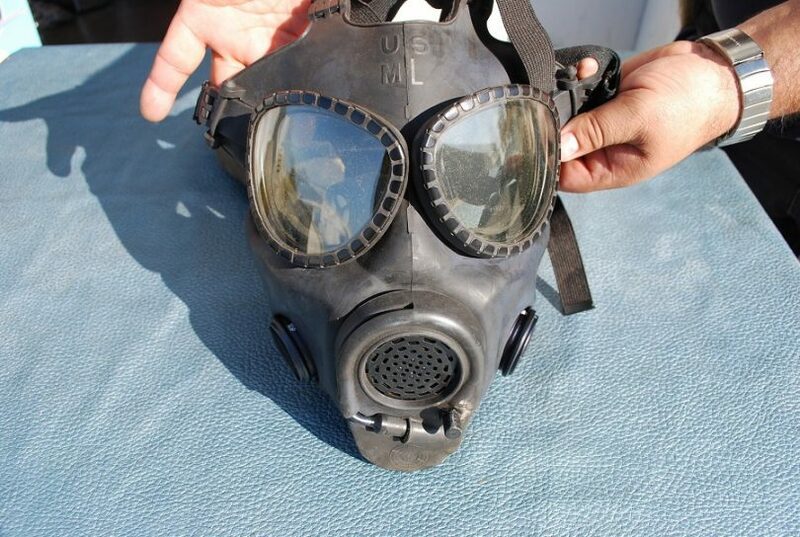 It’s no secret that anyone can buy even military-grade gas masks from various stores, whether online or not, but they do have some disadvantages, such as high retail price and the need for regular maintenance. The upside is that they offer the guarantee of quality and safety. Nevertheless, even if you buy the best gas mask there is, you can’t carry it around with you everywhere you go, because that would raise suspicion from other people, not to mention that it would prove rather uncomfortable – you can’t just put it in your briefcase since it wouldn’t fit. The alternative to buying a gas mask is making one on your own, using materials you probably already have lying around your house, and which are pretty affordable in case you don’t. 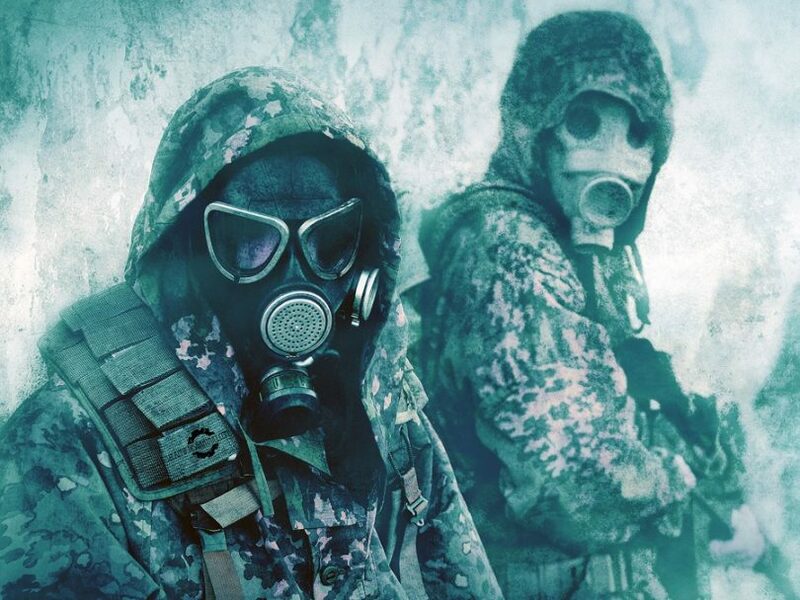 On the flipside, a DIY gas mask can protect you to some extent against fire or dust particles, but it’s not that effective as a standard or a military gas mask when it comes to biological or chemical attacks. The filters, fibers, vents and valves used by topnotch military gas masks can filter out even the most dangerous chemicals from the air, but a homemade one is just a last resort which will never have the same quality. 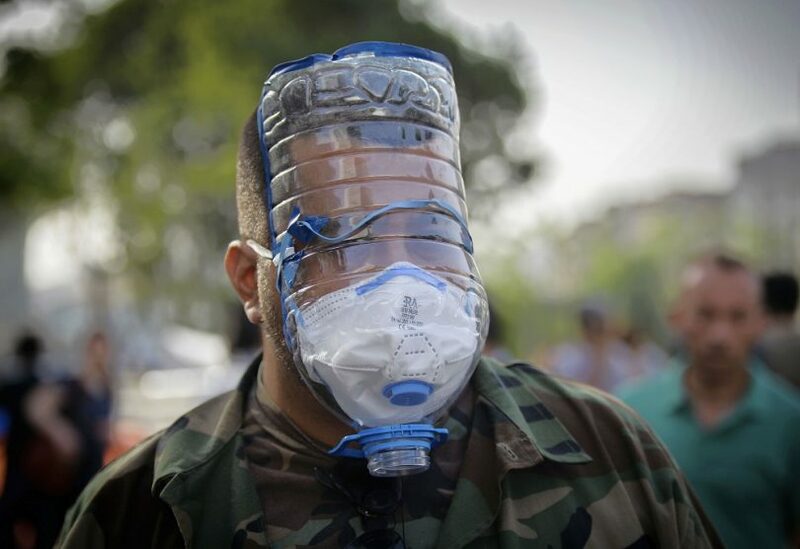 However, a homemade gas mask can be a fun project and it can help you in some circumstances when you need protection. Protection from a plethora of hazardous substances. Easy and fast to make – less than 15 minutes. You don’t need a lot of materials. You don’t need a lot of expertise. It’s cheap – under $5. A half a gallon soda bottle. Rubberized foam insulation strip – minimum 1 inch wide. Clean the plastic bottle and remove the labels. Using the marker, draw an area shaped as an U which should be big enough to fit your face. 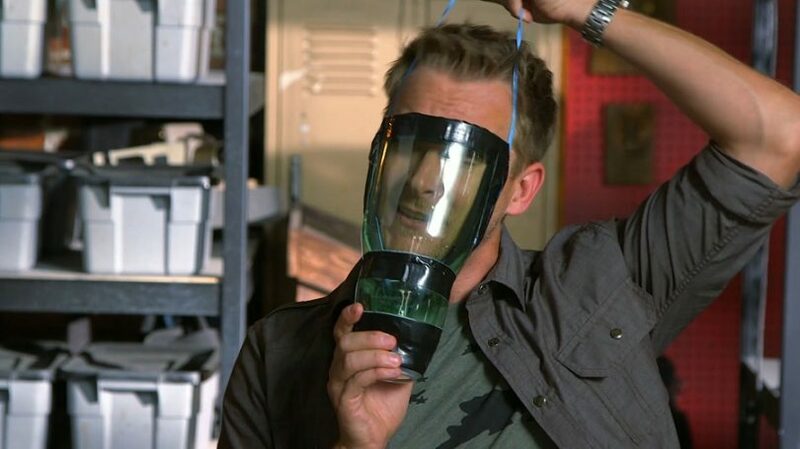 It shouldn’t be bigger than that, in order for the mask to be air-tight, but it shouldn’t be uncomfortable either. Cut around the U shape with a razor or an exacto knife, and also remove the bottom. Adjust the shape until it fits perfectly. 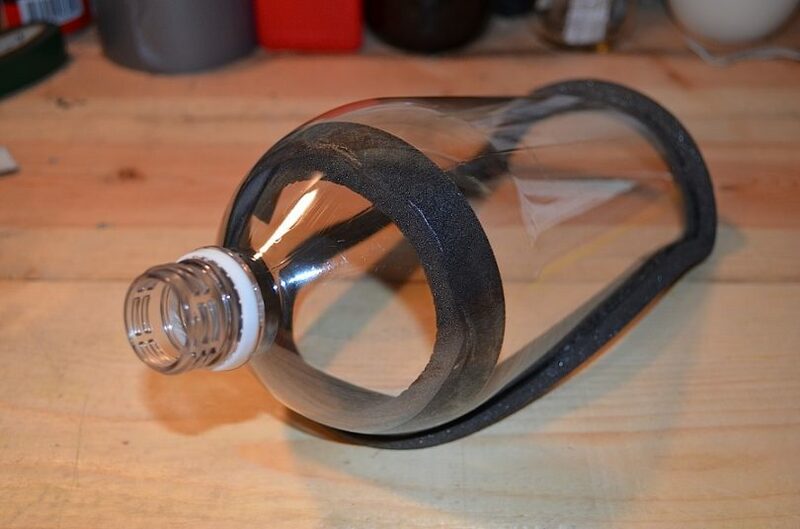 Put the rubberized foam insulation on the bottle’s edges, to create a seal. 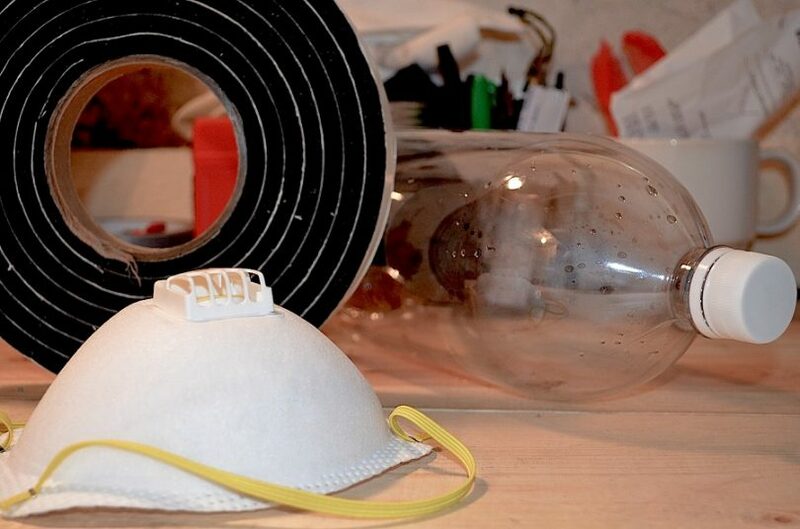 Make a circle of foam insulation inside the bottle, where you will place the N95 mask which acts as a filter. Place the N95 mask 2 inches up from the spout. Cut the N95 mask’s edging carefully, leaving enough to seal the edges. Place the N95 inside the neck of the bottle, pointing the filter out and down towards the spout. Use the elastic bands from the N95 mask to secure the gas mask to your face. For safe keeping and best maintenance, put the finished gas mask in a plastic bag that’s well sealed or in an air-tight container. To ensure that its filter doesn’t become contaminated, and you can confidingly use it in emergency situations. In order to further protect you from hazardous gases, you can make a homemade air filtration system to accompany the soda bottle gas mask. It will certainly not be as high-quality or as efficient as a military-grade one, but it will filter better some toxins and particles in the air, offering you better protection from tear gas for instance. 2 bottles of a quarter gallon each. Pillow stuffing. If you don’t have pillow stuffing, use rags from old shirts, socks or cotton balls. Rubber hose or old vacuum hose. 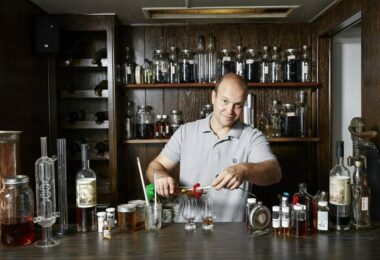 Cut off the top of the bottle, using the razor blade to leave an open cylinder. Fill the bottom of the bottle with 3-4 inches of activated charcoal. 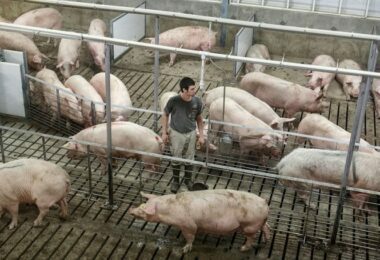 This will absorb the noxious gases, filtering the air efficiently of chlorine and carbon-based chemicals. Cut the bottom of the other bottle, by slicing 1-2 inches with the razor blade. Remember to leave the cap on. Put 3-4 inches of pillow stuffing inside the top of this bottle. The pillow stuffing works well to remove physical contaminants such as dust, ash and tear gas from the air. Slide the bottles together and use tape to bind them shut. You will create a seal and finish the air filter. With the razor blade, make a few holes in your filter, at the end where the charcoal is, in order to allow air to get in. Don’t do this until you actually need to use the filter, or otherwise the activated charcoal will only absorb the moisture from the air, rendering it totally inefficient when you actually need it most. Clean a rubber hose or an old vacuum hose with soap and water. Use the rubber hose in order to connect the bottom of your air mask to the filter. Use duct tape to seal the ends shut. Remove the cap from your filter only when you need to use it. 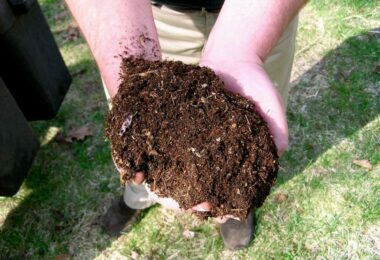 Otherwise, the charcoal will absorb the moisture from the air and the filter will become useless. Replace the activated charcoal every time you use the filter. Each use means that the activated charcoal will absorb chemicals and become full and therefore inefficient. Canister or ordinary tin can. Bathing cap. This is the mask that comes on your face. Charcoal and soda lime. This is wrapped in two layers of handkerchiefs and packed into the can. Powder-puff box. This has a clear lid, and it’s the window the user looks through. Using a knife, make an X shape at the top of your soda can. Fit the snorkel through the hole, but don’t push it all the way through. Drill a hole through the can flaps and the end of the snorkel tube. Insert a wire through the holes and bend the ends of this wire over to secure the assembly. Wrap the end of the can and the joint with the tube with plastic cling-wrap and tape. Crush the charcoal, mix it with water or soda lime until it turns into a paste, then dry it. Put a handkerchief in the base of the can, and another on top of that to prevent charcoal dust from going into the tube and your lungs. Put the charcoal in the can. Tape a handkerchief over the end of the can and cut off the excess. As a conclusion, if you don’t have enough time to make a better gas mask because a fire has just started or you’ve been trapped under the debris caused by an earthquake, you can improvise a very rudimentary gas mask from a T-shirt. This can potentially save your life, as it manages to block some of the dust or ashes in the air. To do this, all you need is a T-shirt or other cotton clothing item, which you tear in order to cover your nose and mouth with the strips. If you can get it moist before actually covering your respiratory ways with it, it will be even more efficient. If, on the other hand, someone has been firing tear gas, use cider vinegar instead of water, because it will protect you from inhaling it. It won’t protect you for long, if you’re stuck somewhere, but if you’re moving to safety and can escape the dangerous area, it can do the trick. Even though you are not in any immediate danger, knowing how to protect yourself in the case of a gas leakage is definitely a very useful information. 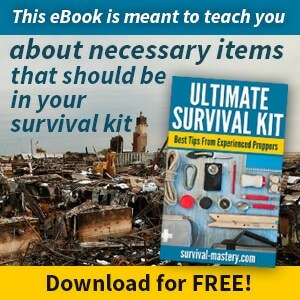 For more tips on how to prepare for any disaster, check out our article on this timely topic. Hoping we managed to help you with the necessary information, we’re waiting for your opinion in comments.